Finally, I had all the ingredients amassed to make this soup! Usually it's turducken but this year we also had a goose, so I could play around a bit. Yesterday I made the turkey stock - two gallons of stock. Don't judge. 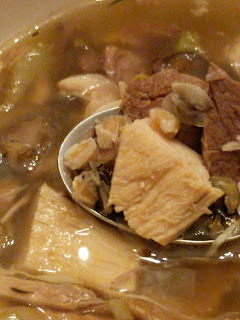 Once the vegetables are sautéed, the meat and stock were added to the pot. This was brought to a boil and then simmered for at least 30 minutes. After that, the rice and farro were added and continued to simmer until done, about another 30 minutes. Super easy, as long as you have everything ready to go. Now I have 14 pints of soup in the canner, and at least 3 more quarts in various containers in the fridge and the freezer. I can use the non-canned stuff for lunches at work over the next week and gradually start to dip into the canned ones later. Once these are done, I will can the rest of the turkey stock. Eight Nine(!) pints worth. This soup won first place at the fair!